Three hallmarks are: the typically unverified claims and videos showing children being hosed down, which are attributed to the discredited media outlet, the so-called White Helmets. This group is embedded with terrorist organizations like Nusra Front and Jaysh al Islam, among others, but is eulogized in Western media as a respectable source. Anything that the White Helmets claim should be taken with extreme caution, if not contempt. Secondly, the unverified claims are nevertheless quickly and uncritically broadcast by Western mainstream news media with the pejorative implication of the Syrian “regime” being responsible, as well as allied Russian forces. Thirdly, the US and other Western government then neatly jump to the desired conclusion that the Syrian “regime” and Russia are to blame, and add that they are now considering a military intervention in Syria “in response” to the “horrific” crime against civilians. The unfolding scripted nature of the “responses” points to the latest incident in Syria as being a classic false flag. However, a priority question is: what took the perpetrators of the stunt so long? For the past two months, the Syrian government and Russian military intelligence have been warning that such a false flag event involving chemical weapons was imminent. Russian intelligence has on several occasions provided public information showing the clandestine movement of chemical materials by anti-government militants. This was while the Syrian army launched its offensive in February to retake the last remaining major stronghold for the insurgents, in the Eastern Ghouta suburb near the capital Damascus. As the Syrian army steadily recaptured the vast, sprawling area, along with Russian air support, there were credible reports of makeshift laboratories being found that had been abandoned by fleeing militants. 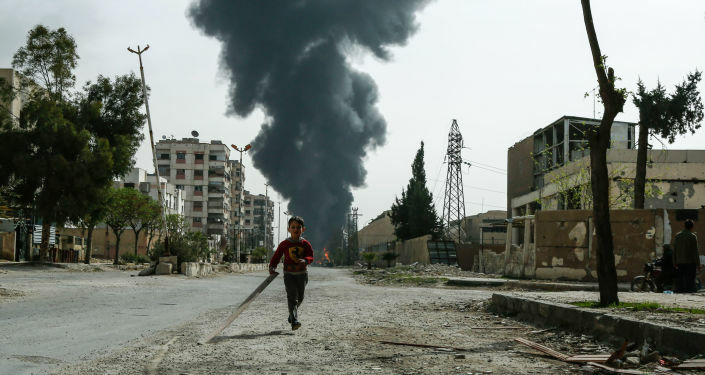 Those laboratories were commonly stocked with vats of chlorine – the toxic volatile chemical that is now alleged to have been used against civilians this weekend. The Syrian government and Russia categorically reject accusations that they were involved in the weekend incident in Eastern Ghouta where Western media outlets are reporting that up to 100 people were killed in a chemical weapon attack. As in previous incidents of alleged chemical weapons, the numbers of injured are never verified. Video footage emanating from the so-called “rebel” side cannot be confirmed in terms of numbers, dates and even location. This was the case in the infamous incident back in August 2013 in Eastern Ghouta, as well as the equally suspicious alleged “sarin” attack in Khan Sheikhoun in Idlib Province on April 4, 2017. UN studies claiming past Syrian government responsibility have been undertaken remotely and rely heavily on testimonies from “rebels”. Attempts by Russia and Syria to send on-the-ground independent inspection teams have always been blocked by the US, Britain and France at the UN Security Council. Syria and Russia say that the latest weekend’s unverified use of chlorine gas is most likely to have been a provocation staged by the last-remaining terrorist pockets in order to prevent the final evacuation of Eastern Ghouta. 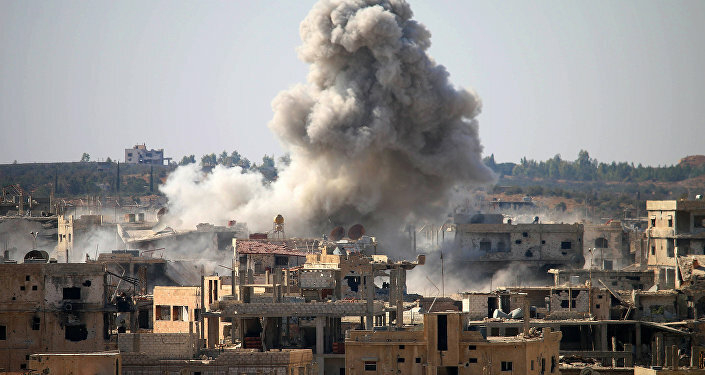 After nearly two months, the Syrian armed forces and Russian allies have routed militants from the suburb which the militants had held siege under a reign of terror for the past six years. Civilians liberated from the terror siege have told horror stories of living as captives under the tyranny of self-styled jihadists and their cult-like barbarism. Civilians were kept in cages on streets, used as human shields. Young girls were snatched from their families and raped. Medicines and food were hoarded and used for extortion. These are very armed groups whom Western media lionize as “rebels”. As much as 95 percent of Eastern Ghouta has already been liberated by the Syrian army, with tens of thousands of civilians now being cared for in relief centers run by Syrian and Russian medics and other humanitarian workers. The claim that Syrian and Russian forces would now use chemical weapons to defeat the dregs of these insurgents is simply preposterous. In any case, the Syrian government has repeatedly stated that it has never used chemical munitions, with its arsenal having been destroyed under a UN-brokered agreement back in 2014. State Dept Says Russia Responsible for "Brutal Targeting of Countless Syrians With Chemical Weapons"
No, the latest incident in Eastern Ghouta is so obviously a false-flag event. It has means and motive written all over it. Apart from the hasty condemnation of the Syrian government and Russia over the incident, the US has also said it is considering a “response”. This could mean a military attack on Syria, as happened following the incident in Khan Sheikhoun on April 4 last year. Three days after that incident, President Trump ordered nearly 60 cruise missile strikes on Syria. 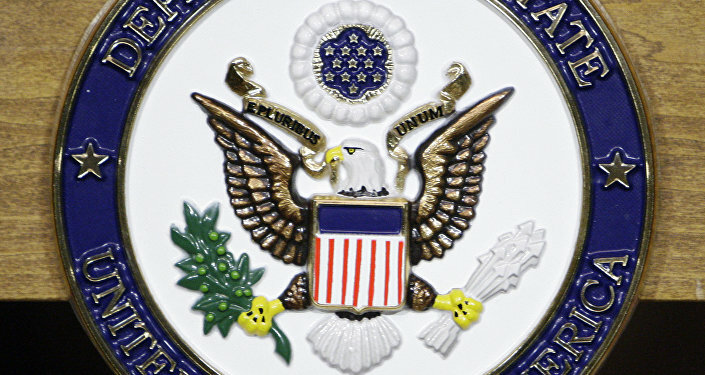 The US State Department continues today to cite that action as a precedent. It claims that the Syrian government and Russia were responsible for the Khan Sheikhoun incident, even though there is strong evidence it too was a false-flag event mounted by “rebels” to elicit an American military strike against the Syrian government. Since then, however, Russia has warned that any further US military strike on Syria would not be tolerated without an armed response. The timing of the latest provocation with chemicals is curious. Of course, the US, Britain, and France have all said at various recent times that they would take military action against Syria if evidence emerged of chemical weapons being used. The NATO powers would seem to have their pretext now following the weekend event. Will they follow through with their threats of military action? On one hand, it seems unlikely. Because the Western-backed terror proxies have been so roundly defeated by Syria and Russia. At this stage, a NATO military intervention would seem to be a lost cause. Last week, President Trump made the surprise announcement that he wanted to withdraw US troops from Syria, in what can seen as an indication that the White House knows the “regime-change game” is up. So, was this weekend’s staged atrocity in Eastern Ghouta a last-bid attempt by American warmongers – the CIA and Pentagon – to force the president’s hand to finally escalate the war in Syria? A last-ditch throw of the dice by the war gamblers while they feel Russia is on the back-foot over the Skripal poison stunt in England? We’ll see. But the false-flag trick has been tried so many times already in Syria by NATO military intelligence and their proxies on the ground. There now seems to be a deep wariness and a weariness among the Western public that would make any direct military intervention in Syria by the US and its European allies politically unviable. Whoever is cueing these false flags seems to have lost the knack for effective timing. The views and opinions expressed by Finian Cunningham are those of the columnist and do not necessarily reflect those of Sputnik.